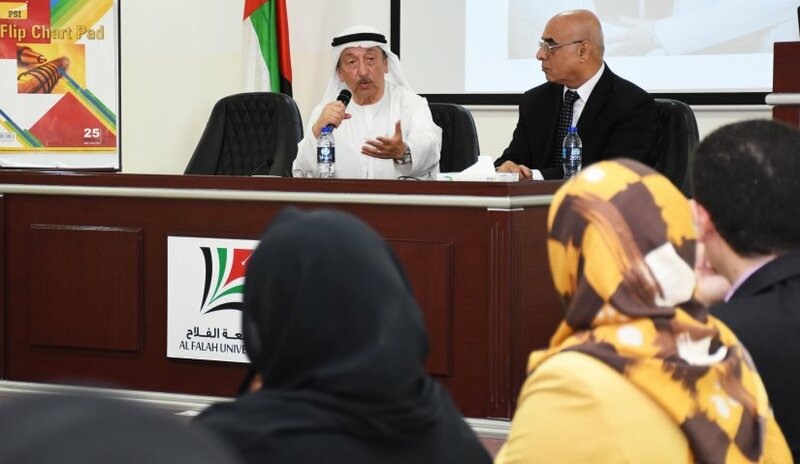 The Deanship of Student Affairs at Al Falah University organized a lecture on the topic of the Life of the late Sheikh Zayed by Mr. Mohammed Al Qudsi, a senior member of the Abu Dhabi TV team. Mr. Al Qudsi addressed Sheikh Zayed, may God have mercy on him, in achieving his vision in the establishment of modern Abu Dhabi by taking power in August 1966, the union of the United Arab Emirates in December 1971 and the establishment of the Gulf Cooperation Council Abu Dhabi in May 1981. The lecture also addressed Sheikh Zayed’s active and influential role in the Gulf and the Arab world which is still visible until the present day.